Kolkata now has a private beach to take you up for a romantic date or a family dinner. This one is surprisingly inside a restro in Tollygunge. Craving the sand and the sea, but work's too heavy to take a break? Remedy's ready at hand because Kolkata's got a new restro that's bringing the beach to the city along with tasty seafood. Head up to Tollygunge's Russo Road and check into the private beach Sea-Estta Inn has made for you. Taking theme restros to a new high, this eatery has created a real beach scene with sand and water under your feet--a collonade of street lamps, conchs and shells dividing the room into half. Take your pick of sand and water before getting down to the business of gorging sumptuous seafood of squids, scalops, lobsters, octopus and others. 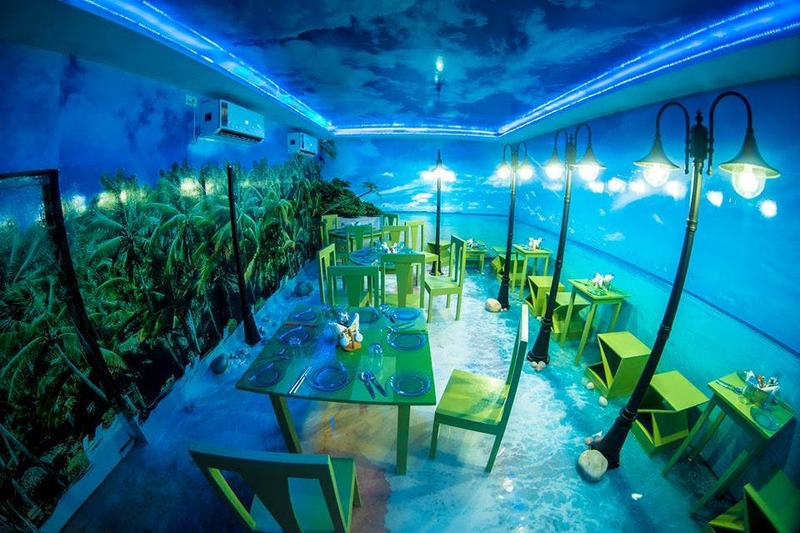 Gorge on their popular lobster dish of Gung Yi Kratim Prik or their Twin crabs while soaking in the perfect seafront atmosphere with palm trees scaling up the walls as posters and a 3D sky over head. It could have been an absolute no-fail place if the space was not so tiny. Keeping up with the fun factor, this place also has interesting offers on the house. They have an open a la carte option where you can order almost everything on the menu for jut INR 1,500, if you can wipe off your plates within an hour. Also, on Tuesdays they host a 'best dressed couple' contest, and if you and bae are seriously cool to win the title five consecutive times then you get a free trip to Goa.